Owing its inspiration and title to On the Origin of Species, James W. Valentine's ambitious book synthesizes and applies the vast treasury of theory and research collected in the century and a half since Darwin's time. By investigating the origins of life's diversity, Valentine unlocks the mystery of the origin of phyla. One of the twentieth century's most distinguished paleobiologists, Valentine here integrates data from molecular genetics, evolutionary developmental biology, embryology, comparative morphology, and paleontology into an analysis of interest to scholars from any of these fields. He begins by examining the sorts of evidence that can be gleaned from fossils, molecules, and morphology, then reviews and compares the basic morphology and development of animal phyla, emphasizing the important design elements found in the bodyplans of both living and extinct phyla. Finally, Valentine undertakes the monumental task of developing models to explain the origin and early diversification of animal phyla, as well as their later evolutionary patterns. Truly a magnum opus, On the Origin of Phyla will take its place as one of the classic scientific texts of the twentieth century, affecting the work of paleontologists, morphologists, and developmental, molecular, and evolutionary biologists for decades to come. "Valentine brings together a mass of evidence from many sources in a magisterial compendium. . . . There is direct evidence from the fossil record, of course. But there is also new evidence from trees of relationships derived from studying similarities in gene sequences of living animals. These are often ambiguous. Then there is evidence from the way genes are expressed during the growth and development of the body plans of animals. . . . Add to this classical morphology and embryology. . . . It is an astonishing range of information all brought together within one pair of covers. It’s enough to make mere mortals awestruck. . . . Valentine [offers] a judicious evaluation of an astonishing array of evidence." "A likely candidate for the bookshelves of those who hunt for pre-Cambriam fossils or the historical patterns in DNA sequences." "Valentine has indeed produced a wonderfully informative and well-written book by mixing together three basic ingredients that are now available: paleontology, molecular phylogeny, and developmental genetics." "Valentine envisions the study of the origins of phyla as a multidisciplinary investigation of patterns and process. 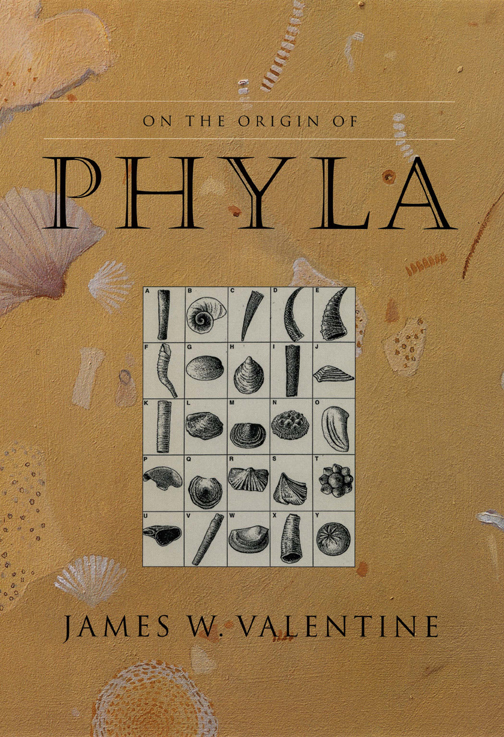 His book provides a masterful guide to what we know about the origins of the phyla and current research issues relating to the early history of animal life. . . . Valentine does not hesitate to speak his mind, which gives the book a forceful discussion of well-argued ideas." "A magnificent book--authoritative, rich with relevant knowledge, and clearly written. It may be many years before it will be surpassed by any other treatise on the subject."